THE LAST HUNTER – Collected Edition – Available Now! This project has been in the works for about a year now and is the culmination of four years of writing, editing and designing. The finished product includes all five Antarktos Saga novels: Descent, Pursuit, Ascent, Lament and Onslaught. It also includes more than twenty illustrations by four different artists, an interview with me featuring questions asked by fans of the series, and a new short story that reveals possibilities for future novels set in the world of Antarktos. The hardcover of this collected edition is listed at $35, but includes $75 worth in books, is 800 pages long, and is currently on sale at Amazon for $31. So grab it before they put the price back up! And if you order now, you should get it in time for Christmas. **If you’re one of the many people who have already read the series, I have a favor to ask. Would you be amazing and post a review for the collected edition. You can even copy and paste reviews you might have written for the individual books. This will just help the collected edition get into the automated recommendation system sooner. Thank you! The second book of the Antarktos Saga is available now! The brutalizing of Solomon Ull Vincent continues in The Last Hunter – Pursuit. New characters are introduced and things get intense as Solomon must now confront his personal demons along with the actual demons seeking to capture, break and remake him. I’m hoping to have book 3 (of five) out this fall and the final two books out in 2012. The Hunter series is the best of all my books, containing the same brutal action as my other novels, but with a strong first person voice and a lot more heart and a fantastical world that really lets my imagination run wild. The Last Hunter – In Print! 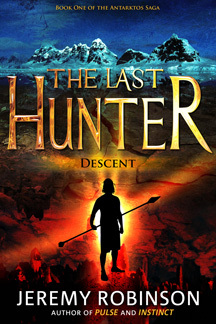 If you’re one of the majority that does not yet own an e-reader, THE LAST HUNTER – DESCENT is now available to you. The book can be ordered via any bookstore or from Amazon and B&N. What’s great about the timing of this announcement is that just ONE HOUR ago, I finished the second book in the Antarktos Sage, THE LAST HUNTER – PURSUIT, which should be available in all e-book formats AND print, in June.